The Veblen House garden, so loved by those who have lived in the house over the years, continues to bloom. 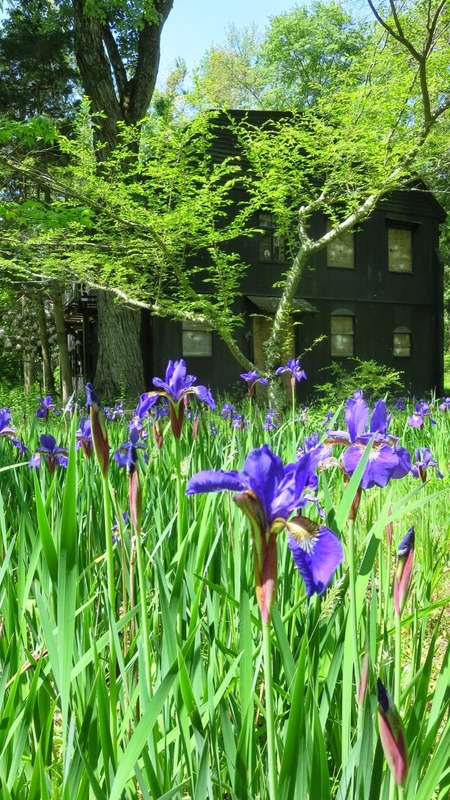 Iris make a blue arc in the front of the house, perhaps a legacy of Elizabeth Veblen. A Rhododendron was tall enough to elude the deer through the long winter. 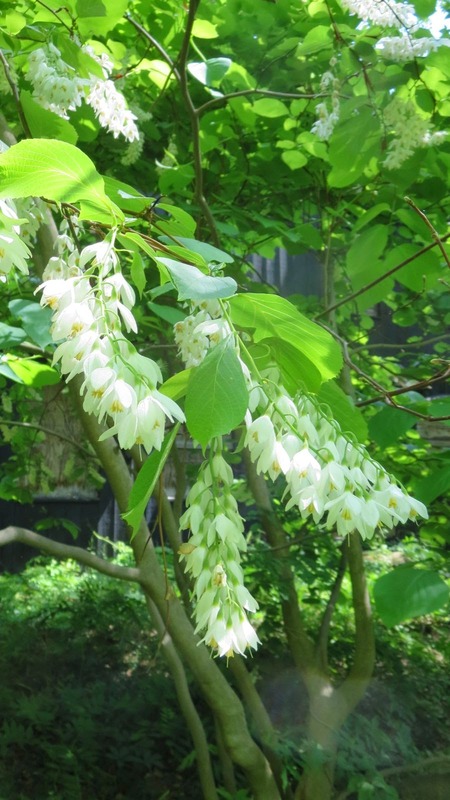 A Fragrant snowbell (Styrax obassia) adds an oriental touch around back. 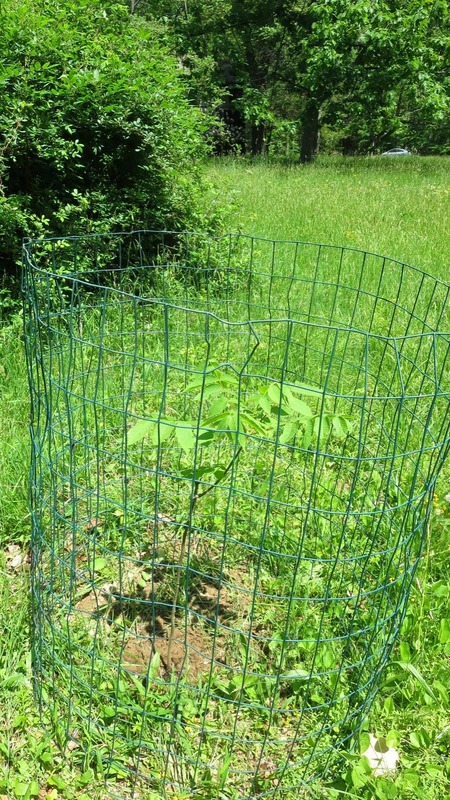 And a new planting at the edge of the field, part of a town-wide effort to bring back the native butternut, may need some watering if a drought comes along. I saw it along the uppér part of the trail (red one?) after passing the cottage and little barn (corn crib?) on my right. It was singing and looping around the rocks at the top between the gas pipeline, the rediscovered "cliff", and the stream going through the boulder field. Also had Scarlet Tanager, 3 Veery, Ovenbird, 4 Wood thrush, Pileated, and 2 Common Yellowthroat Warbler." Here is more info about the species, including a description of its preferred habitat: "Reaches highest densities in large tracts of mature, uninterrupted, deciduous forest with a dense shrub layer and scant ground cover." A sample of its call can be found here. It's because of the Veblens' initial donation of Herrontown Woods, and the subsequent efforts of local and regional land trusts, with additional funding from the town and county, that species like this can be heard in the deep forest of Princeton Ridge East. The Rotary Club of Princeton is one of those organizations that works quietly to do a lot of good. I've been getting to know the club's members through their efforts to help save the Veblen House. They are a group with a can-do attitude, who find pleasure and satisfaction in serving the community, and have international service projects as well. 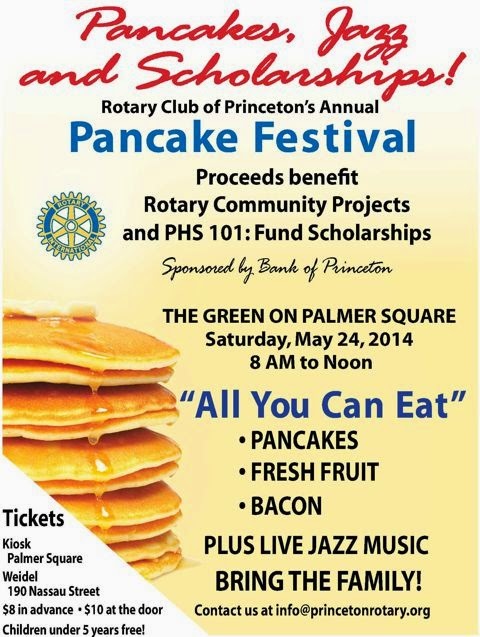 Their annual Pancake Festival at Palmer Square makes it easy to support their work. Come by tomorrow, Saturday, May 24, for food and jazz, then catch the Memorial weekend parade down Nassau Street. Learn more about the Rotary at http://www.princetonrotary.org/community.html.